When Lindsay Nohl was a teenager, she was obsessed with skateboard culture and spent many hours on wheels. Horror movies and gruesome video games filled the rest of her free time. So for Nohl, who grew up in Mequon, Wisconsin, images of skulls, crossbones and severed limbs are cherished childhood memories. "I got the skateboarding magazine 'Thrasher,'" Nohl recalled. "It was really great, [with] these really awesome spreads. One was called 'The Hall of Meat' where you would get to see these disgusting bruises or whatever from people doing all these crazy tricks and hurting themselves." Two decades later, Nohl, 33, is a freelance designer for whom skateboarding and Halloween are kindred spirits. That's the premise of "Skate or Die" a visual arts show by Nohl and her husband, Chris Hajny at Light Grey Art Lab in Minneapolis. It mixes the devil-may-care mindset of skateboard culture with the macabre imagery of the season. As a boy, Hajny also was drawn to that scene, which he preferred to the typical teenage pursuits, like baseball. "I was always into monsters, guts, gore, mutants, an eyeball with veins attached to it flying out of someone's skull," said Hajny, who grew up in Stoughton, Wisconsin. "Just really hilariously grotesque things." Both were captivated by what they deemed a lifestyle of rebellion. "It might have been motorcycles in the '50s,"said Hajny, 32. "But it was skateboards when I was growing up." By day, Hajny and Nohl create art for everything from product packaging to travel mugs. Two and a half years ago, they launched Light Grey Art Lab, which became known for its collaborative group projects. While most galleries simply display artists' work, Light Grey Art Lab is part of the creative process. The four-member team develops a show concept, then invites designers from around the world to submit their artistic interpretations. For the gallery owners, the current project is a nostalgic nod to their youth. Inspired by the dark aesthetic of the skateboard subculture, "Skate or Die" includes designs from 60 artists, which will be displayed on Canadian Maple skateboard decks. 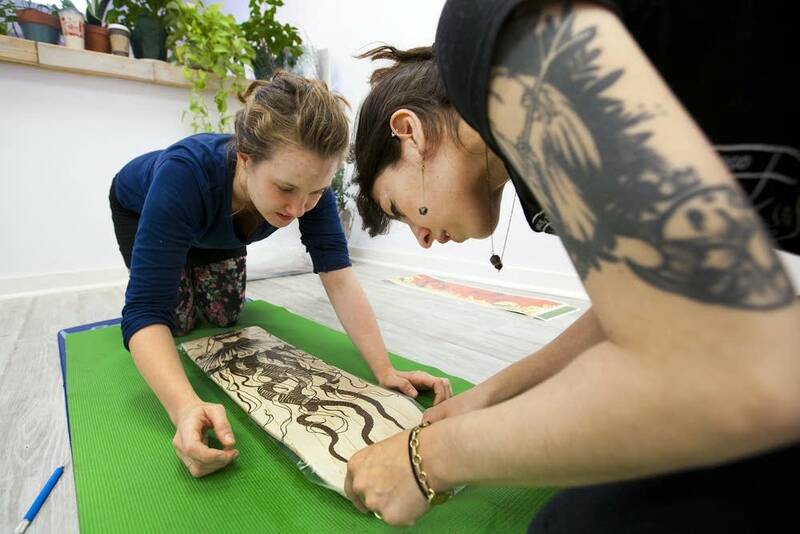 After participants send in digital images, gallery employee Jenny Bookler helped transfer them onto the wooden canvases. 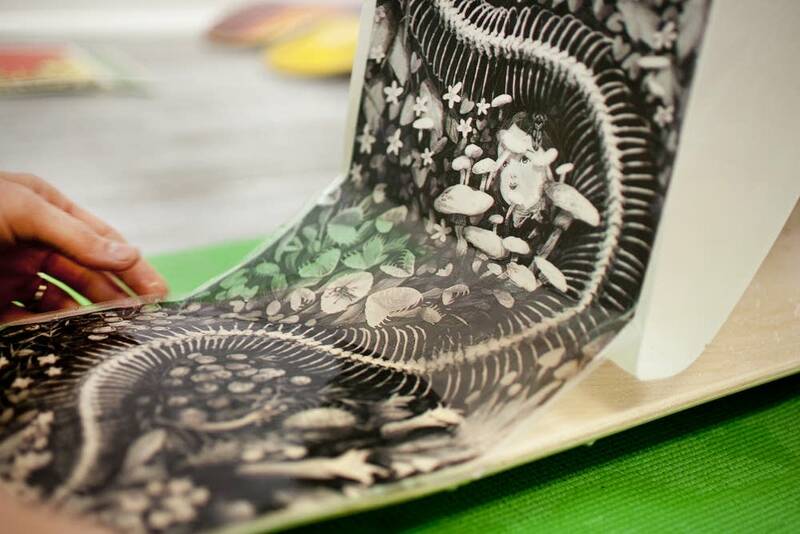 "See, these prints transform as they get put onto a board," Bookler said. "They really do have a different life as soon as that happens." One submission displays a snake skeleton on a bed of wildflowers. The next showcases the chopped up body of a cartoon werewolf. On a blank board, Nohl adhered an image she described as "a burlesque lady/jelly fish." "There are some things that aren't death related, but they still have that mysterious quality," she said. "We got one from a guy who is from France and he created a very cute looking girl who's holding an axe. It's really interesting to see that alongside a skinless beast man over here." Most of the artists in the show are commercial designers or illustrators whose work generally shows up in magazines, not on gallery walls. "A lot of these guys are doing things and only see it on the computer," Bookler said. "So this is really cool to see it come to life in this other way." Light Grey Art Lab employees — artists themselves — have spent countless hours printing, transferring, polishing and hanging the work of other artists. But in a society where people click through countless images a day on the Internet, giving design its due is part of the gallery's mission, Nohl said. She said celebrating art is important — whether it's classical Renaissance painting or the image of organs and entrails on a skateboard deck. "These are efforts of people who have spent a piece of their life making this thing," Nohl said. "It deserves other people's ability to stand in front of it and look at it longer than one click on the web or just scrolling through your Tumblr." Gallery hours: Wednesday through Saturday, 12 to 6 p.m.; Sunday, 12 to 5 p.m.
Nikki Tundel joined Minnesota Public Radion in 2002.